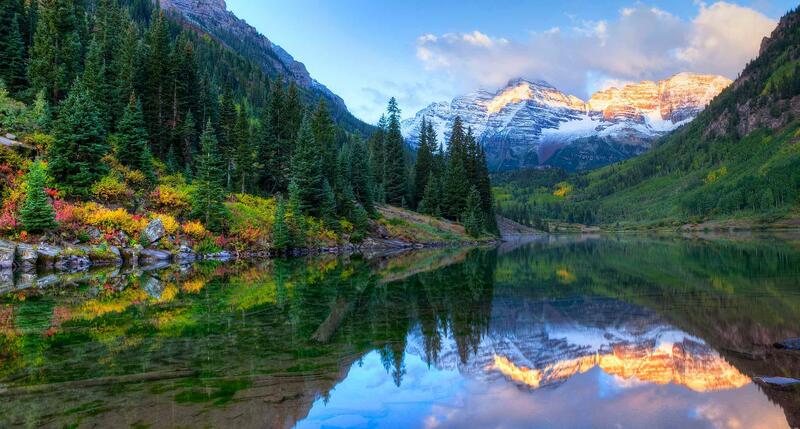 A simple glance into a typical Colorado travel guide will overwhelm anyone with the wide range of possibilities and gorgeous landmarks the state has to offer. You can stay at beautiful rentals in Colorado or go the hotel route, but whatever you decide, there is tons to see and do in this wonderful destination. From the spectacularly wild scenery of the Garden of the Gods or the Black Canyon to the beautiful tranquility of the Vali town and the surrounding areas, Colorado has something anyone can enjoy. This stunning state offers year-round destinations filled with excellent, breathtaking landscapes. You won’t be able to travel and work easily, as a lot of what Colorado can offer involves disconnecting and getting back in tune with nature. One of the most visited national parks in the United States, Rocky Mountain National Park is full of wonderful landscapes: alpine lakes and meadows, over 100 mountain peaks, forests and thriving wildlife. The main driving route that will take travelers through the park is the Trail Ridge Road that extends to over 12,000 feet. The route is a great way to access the astonishing terrain without any difficulty. Although a car ride through the road will offer great landscapes, nothing beats hiking a trail. Some of the popular activities are hiking, camping, fishing, wildlife viewing, climbing, and bouldering. A registered National Natural Landmark and a unique landscape, Garden of the Gods is composed of jagged stone towers and fins at 300 feet from the earth. The landscape is completed by huge boulders and rock piles. There are several easy trails that allow tourists to get very close to the impressive rocks. The park is one of the best spots for rock climbing. Other activities that are popular are mountain biking, horseback riding, biking in the special biking lanes, and even Jeep and Segway tours. Any visitor will be instantly amazed by the breathtaking ruins and the access the Mesa Verde National Park allows. Cliff Palace is the park’s most important piece and has a breathtaking setting and well-preserved ruins. Some tours will allow tourists to climb right into the heart of the dwelling. Mesa Verde, formerly home of the Ancestral Pueblo, can be accessed by a long road that takes above the landscape. It takes about 45 minutes to drive from the highway to the site and it is worthwhile. Pikes Peaks is part of the Pike National Forest and it can be easily seen from Colorado Springs. It rises up to 14,115 feet in elevation and is one of the most popular fourteeners in Southwest. Pikes Peaks is not popular only in the United States, but it is one of the most visited mountains in the world, bested only by Mt. Fuji. While many mountain peaks are difficult to climb and thus inaccessible to average persons, Pikes Peak can be seen with the Pikes Peak Cog Railway, a train that takes the tourists through one of the most beautiful trips. An extraordinary, beautifully rugged canyon, Black Canyon is part of the attractions in Gunnison National Park. It is hugely overwhelming and has some of the oldest rocks and steepest cliffs in North America. The canyon was sculpted by the Gunnison River in over two million years. The popular activities include camping, sightseeing, hiking, rock climbing and wildlife watching. The trails are mostly flat and easy on the rim. The most adventurous of people can hike right into the canyon but the trails aren’t properly marked and the conditions require a degree of resilience.